Department of Pharmaceutical Analysis and Quality Assurance, Vignan Pharmacy College, Vadlamudi - 522213, Andhra Pradesh, India. ABSTRACT: An accurate and precise High-Performance Reversed-Phase Liquid Chromatographic and UV spectrophotometric methods were developed and validated for the quantitative determination of Cilnidipine, a novel generation Ca channel blocker in the pharmaceutical dosage form. Good quality chromatographic separation of Cilnidipine was carried out by using thermo scientific model C18 Column (4.6 mm i.d. × 250 mm, 5 µm particle size) (based on 99.999% ultra-high purity silica) using mobile phase consisting acetonitrile: methanol (50:50% v/v) at flow rate of 1.0 mL/min. The λmax of the Cilnidipine in methanol (as a solvent) was found to be 242 nm. The drug following linearity in the concentration range of 2-10 µg/mL with a correlation coefficient value of 0.9999 for both UV and HPLC methods. The regression equation for Cilnidipine UV method was found to be Y = 0.081x + 0.0017 and for HPLC method was Y = 25517x - 4755. 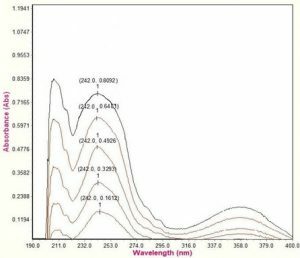 LOD and LOQ were found as 0.15095 µg/mL and 0.45742 µg/mL for UV method and for HPLC method it was found to be 0.003 µg/mL and 0.0099 µg/mL. The developed methods were validated in pursuance of ICH Q2 (R1) guidelines. Both the methods were linear, precise, accurate with recoveries in the range of 98-102% and low values of % RSD are indicative of the accuracy of the method. The detailed quantitative results of this study show that this method is simple, quick, precise, accurate, sensitive, cost-effective and robust. Thus, the developed UV and gradient RP-HPLC method can be successfully applied for the routine quality control analysis in pharmaceutical dosage forms. INTRODUCTION: The chemical name of Cilnidipine is 2-Methoxyethyl (2E)-3-phenyl-2-propane-1-yl 2, 6-dimethyl-4-(3-nitrophenyl) - 1, 4-dihydro-3, 5-pyridine dicarboxylate. Cilnidipine is a slow-acting Ca2+ channel blocker, anti-hypertensive, vasodilator, dual blocker of L-type voltage-gated Ca2+ channels in vascular smooth muscle and N-type Ca2+ channels in sympathetic nerve terminals that supply blood vessels. Cilnidipine may offer an advantage over Nifedipine as the long term intake of the latter has been linked to increased risk of myocardial infarction and mortality in patients with coronary artery disease. Cilnidipine lowers blood pressure but has less effect on sympathetic activity. Unlike Nifedipine, Cilnidipine does not inhibit PKC (Protein kinase C: a means for isozyme selectivity). A thorough literature survey reveals that there were few analytical methods reported for the determination of Cilnidipine in bulk, pharmaceutical preparations and in biological fluids which include, Visible spectrophotometric method 1, spectrophotometric methods (simultaneous determination) 2, 3, 4, 5, RP-HPLC 6, 7, 8, HPTLC 9, High Performance Liquid Chromatography with tandem mass spectrometry 10, LCMS 11. However, most of the available methods have limitations such as laborious sample preparation, more solvent consumption, long run times for biological samples, low sensitivity, uneconomical and have poor symmetry. Keeping given these we have decided to develop a simple, accurate, precise and reliable UV spectrophotometric and gradient RP-HPLC method for the estimation of Cilnidipine in the pharmaceutical dosage form. The chemical structure of Cilnidipine is shown in Fig. 1. Chemicals and Reagents: Sample of Cilnidipine was gifted from Hetero Labs Ltd., Hyderabad, India. Acetonitrile HPLC grade was purchased from thermo fisher scientific India Pvt. Ltd., Mumbai. Methanol HPLC grade and HPLC grade water got from Merck Specialties Pvt. Ltd., Mumbai, India. Cilnidipine (Cilacar 10 mg) procured form local market and excipients were prepared in our laboratory. Instrumentation: For UV the systronics double beam UV-Visible spectrophotometer 2203 and SL 210 UV-Visible spectrophotometer with 1 cm matched quartz cells was used for all spectral and absorbance measurements and solutions were prepared in methanol. For HPLC the chromatographic system consists of an Agilent SPD 20A prominence UV-Vis detector LC-20AT prominence liquid chromatograph, 1260 Quat Pump VL, 1260 diode array detector. The data were acquired and processed by utilizing EZ chrome elite software. Method Development and Optimization of Chromatographic Conditions: For HPLC development various mobile phases containing HPLC grade water, acetonitrile, methanol in different ratios with or without buffers and also different flow rates were tried. Good symmetrical peak was found when the mobile phase comprising a mixture of acetonitrile: methanol (50:50 % v/v). Selection of Detection Wavelength: The UV spectrum of diluted solutions of different concentrations of Cilnidipine in mobile phase was recorded using UV spectrophotometer. The wavelength of maximum absorbance was detected at (λmax) 242 nm. This wavelength was used for the detection of Cilnidipine. Column Selection: A thermo scientific stainless steel model C18 Column (4.6 mm i.d. × 250 mm, 5 µm particle size) (based on 99.999 % ultra-high purity silica). Column Temperature: A constant temperature of about 25 ºC. Flow Rate: Adjust the flow rate to 1 mL/min so that the retention time of Cilnidipine is about 3.067 min. Preparation of Mobile Phase: Mobile phase was prepared by mixing acetonitrile and methanol in the proportion of 50:50 v/v. The prepared mobile phase was filtered through a 0.45 µm nylon membrane filter and degassed by sonication. Preparation of Stock and Working Standard Solution: Weigh accurately about 100 mg of Cilnidipine and transferred into a two 100 ml volumetric flasks separately. 50 ml of methanol is added for UV method and 50 ml mobile phase is added for HPLC method, and both were sonicated for about 25 min after that add methanol and mobile phase separately in volumetric flasks to get precisely 100 ml stock solutions (1 mg/mL). This solution was further diluted with the same to get the standard working solution. Method-1 (for UV Method): Aliquots of standard drug (0.2-1.0 ml, 100 µg/mL) solution in methanol were transferred separately into a series of 10 ml volumetric flasks, and the solution was filled up to the mark with CH3OH. After setting the instrument for its spectral properties, the solutions were scanned in the wavelength ranging from 200-400 nm. The wavelength of maximum absorption for Cilnidipine was found at 242 nm. A Calibration curve was plotted by taking absorption curve on Y-axis and concentration of Cilnidipine standard on X-axis. For the assay twenty tablets containing Cilnidipine were precisely weighed and was transferred into a cleaned and dry mortar and ground to a fine powder and mixed homogeneously. The stock solution was prepared to utilize an exactly weighed amount of powder equivalent to 100 mg of Cilnidipine was taken and transferred into a 100 ml volumetric flask. The drug was extracted with 60 ml CH3OH and volume were filled up to the mark with the same, i.e., 1.0 mg/mL of Cilnidipine. The resulting solution was filtered through Whatmann filter paper number 41 and degassed by sonication. From this stock solution, 5 ml was accurately transferred to 50 ml of volumetric flask and diluted with the mobile phase to obtain an intermediate solution of 100 µg/mL of Cilnidipine. Aliquot of 1.0 ml resulting solution was mixed with 10 ml of mobile phase to get the eventual sample solution containing 10 µg/mL of Cilnidipine. In fact the absorbance value of the sample was measured at 242 nm. Indeed the % assay was calculated utilizing the average linear regression equation obtained by UV spectrophotometric method. Method-II (For RP-HPLC): The HPLC system was stabilized for forty minutes by following the optimized chromatographic conditions to obtain a stable baseline. One blank followed by three replicates of a single standard solution of Cilnidipine was injected to check the system suitability of the method. The chromatographic run time of ten minutes was maintained for the elution of the drug from the column. The column effluents were monitored with a UV detector at 242 nm. Exactly weighted 100 mg of Cilnidipine was transferred into 100 of volumetric flask, dissolved and diluted up to the mark with mobile phase to get a stock solution containing 1.0 mg/mL of Cilnidipine. Aliquots from stock solution were diluted with mobile phase to attain the standard calibration solutions over the range of 2, 4, 6, 8, 10 µg/mL Cilnidipine for high pressure liquid chromatographic method (n=5). As a matter of fact, the calibration curve was constructed by plotting the peak area of Cilnidipine (on Y-axis) against respective concentrations (on X-axis). For the assay, twenty tablets containing Cilnidipine were precisely weighed and powdered. The accurate amount of powder equivalent to 10 mg of Cilnidipine was transferred into a 100 ml volumetric flask and dissolved in the mobile phase to get 100 µg/mL concentration. Then the solution was sonicated for 20 minutes and filtered through Whatmann filter paper number 41 and degassed by sonication. From this stock solution, further dilutions were made with the mobile phase to get concentration (6 µg/mL) within the linearity range and measured the absorbance at 242 nm. The drug content in each tablet was found against label claim by using standard graph. Method Development Optimization: The optimized HPLC conditions several mobile phases of different compositions were tested to develop an optimization of chromatographic conditions such as tailing factor, decorous peak shape, and theoretical plates. For the selection of the mobile phase primarily methanol, acetonitrile, CH3OH: water, ACN: water has been tested for different compositions. Stationary phase Thermo scientific model C18 column (4.6 mm i.d. × 250 mm, 5µm particle size) (based on 99.999% ultra-high purity silica). SD = standard deviation, RSD = relative standard deviation. * = Average of 6 determinations, SST = System suitability test. Eventually the gradient mode and mobile phase consisting a mixture of acetonitrile: methanol (50: 50 % v/v) at a flow rate of 1 mL/min was found to be satisfactory and proper system suitability parameters obtained. The retention time of Cilnidipine was 3.067 min. The tailing factor of Cilnidipine peak was 1.15. The number of theoretical plates of Cilnidipine peak was 8,999, and the theoretical plates per meter were 179980.Optimized chromatographic conditions, system suitability parameters for estimation of Cilnidipine by proposed gradient RP-HPLC method are depicted in Table 1. Method Validation: The developed RP-HPLC methods were validated in pursuance of ICH Q2 (R1)12-14 for the different parameters like system suitability, specificity, linearity, precision, accuracy, robustness, ruggedness, limit of detection (LOD) and limit of quantitation (LOQ). Summary of validation parameters for determination of Cilnidipine for UV and HPLC is depicted in Table 3. System Suitability: The chromatographic system utilized for analysis must pass system suitability limits before sample analysis can commence. Set up the chromatographic system allow the HPLC system to stabilize for 45 min. Replicates of the sample containing Cilnidipine were injected, and chromatograms were recorded to evaluate the system suitability parameters such as tailing factor (not more than 1.5), theoretical plates (not less than 3000 and % RSD of peak areas of replicate injections of Cilnidipine standards. The parameters were calculated and found to be satisfactory. Linearity: Underdeveloped experimental conditions the relationship between the absorbance and concentration of Cilnidipine was studied. The calibration curve was plotted against concentration vs. peak area by the prepared different aliquots, i.e., (2-10 µg/mL at 232 nm) of stock solution, and the r2 value was determined. Five replicate of prepared 10 µg/mL solution of Cilnidipine taken from different stock solution and measured area. The relative standard deviation was determined. The obtained test results absorbance which is directly proportional to the concentration of the analyte in the sample. Fig. 2 shows the overlain spectra of the UV method. Fig. 3 and 4 show the linearity curve of Cilnidipine UV and HPLC methods respectively. The regression equation for method I and method II was found to be Y=0.081x+0.0017 (r2= 0.9999), Y = 255171 x - 4755 (r2 = 0.999). In fact all the correlation coefficient values were very close to 1 which indicates this advanced method has good linearity. Optical characteristics, regression data analysis of the proposed method for Cilnidipine is shown in Table 2. Specificity: The specificity of an analytical method is to determine the effect of excipients and other additives that are generally present in the formulation. The test results obtained were contrasted with the results of standard drug. Fig. 5 and 6 show the chromatogram of blank for specificity and Cilnidipine sample chromatogram for interference study respectively. System Precision: Six replicate recording of peak area at 242 nm of 10 µg/mL concentration standard solution showed % relative standard deviation (% RSD) less than 2, which indicates reproducibility and thereby the precision of the system. Method Precision (Intraday and Interday): Method precision was determined by performing an assay of the sample under the tests of repeatability (Intraday precision), and intermediate precision (Interday precision) was performed during two consecutive days by two different analysts, at different working concentrations. The percent relative standard deviation (% RSD) was calculated which is within the acceptable criteria of not more than 2.0. Accuracy (Recovery Studies): The accuracy of the method was evaluated by the standard addition method. Recovery tests were carried out by analyzing drug with different compositions. Known amounts of standard drugs were added to pre-analyzed sample at three different levels 50% to 150%, and the mixed standard solutions were analyzed in triplicate at every level as per the suggested method. Percent mean recovery was calculated. The accepted limits of recovery are 98- 102%. Ruggedness: It is the reproducibility of the test result obtained by the analysts of the same samples under a variety of normal test conditions like different analysts, different labs, different assay times and different reagents. A system to system variability was studied on different High-Pressure Liquid Chromatographic systems under similar conditions at different times. In this method, 6 samples were prepared and analyzed as per the test method. Juxtapose of both the results get on 2 different high performance liquid chromatographic systems shows that the assay test method is rugged to the system to system. Robustness: Robustness of the method study was determined by varying the method parameters such as a change in flow rate (± 0.2 mL/min), temperature (± 2 %) and wavelength (± 1 nm). The change in 5 % in the proportion of organic solvent, flow rate, detection wavelength. The standard solution is prepared as per the test method and was injected into the high performance liquid chromatographic system utilizing a different change in flow rates. Where SD = Standard deviation of response and S= Slope of the calibration curve. UV - Spectrophotometric Method: The ultraviolet overlay spectra of the chromatograms of all five concentrations levels of Cilnidipine depicted lambda max 242 nm and a maximum absorbance at 242 nm was selected for measurement of absorbance. The Beer's range was found to be in the range of 2-10 µg/mL of Cilnidipine. In fact the % RSD of the intraday and interday precision for UV method was found to be 0.2064 and 0.0656 respectively. The variability in the precision study was found within limits which indicate that the method was precise. The accuracy of the method was confirmed by the recovery studies, by adding a known amount of the pure drug to the pre-analyzed sample and the percentage recovery was studied. Indeed the percentage recovery was found to be 99.91 - 99.98 ± 0.02. High percentage recovery values which indicate that the developed method was accurate. The limit of detection and limit of quantitation was found to be 0.150951 µg/mL-0.457429 µg/mL respectively. Lastly, the validated method was applied to the estimation of Cilnidipine (Cilacar) marketed pharmaceutical dosage form. Twenty tablets were assayed, and the results are shown in Table 4 which indicates that the amount of drug in tablet sample was good agreement with the label claim. The % content of drug was 99.93 ± 0.080. In fact the working solutions of Cilnidipine in CH3OH were found to be stable for at least seven days. For HPLC Method: As per the guidelines, the mobile phase composition, stationary phase, flow rate, selection of wavelengths were taken for initial optimization. After evaluating all of these parameters decorous results (reproducibility results, good peak shape, minimal peak tailing, and short runtime were identified) were found when a mobile consisting of acetonitrile: methanol in the proportion of (50:50 v/v) and 1 mL/min flow rate was used. In fact the retention time of Cilnidipine was found to be 3.073 min. The tailing factor of Cilnidipine peak was 1.20. Calibration standards were analyzed by HPLC method (n=5). The calibration curve was constructed by concentrations and a peak area of Cilnidipine. It was found to be linear in the concentration range 2-10 µg/mL with a good correlation coefficient greater than (r2 = 0,999). Fig. 7 to Fig. 11 shows the standard chromatograms of Cilnidipine at optimized HPLC conditions. The number of theoretical plates of Cilnidipine peak was 8,999 and the theoretical plates per meter were 179980. Regarding specificity which was studied for the examination of the presence of interfering components. The specificity of the proposed method was evaluated by making a synthetic mixture in the drug with commonly occurring excipients that are found in most tablet formulations. Indeed the contrast of chromato-grams, there was no interference from placebo with sample peak. They don't interfere with the elution or quantification of Cilnidipine furthermore the decorous impressive shaped peak also indicate the specificity of the method. Therefore it was concluded that the method is specific. The precision study was determined to find out intra-day and interday variation in the test methods of Cilnidipine for six times on the same day and 3 different days. The % RSD of the intra-day and inter-day precision obtained was <2 which indicates that the proposed method is precise. The accuracy of the method was determined by using recovery study using a known amount of standards added to the pre-analyzed samples. The percentage recovery was found to be between 99.75-99.92 ± 2 with % RSD values between 0.226-0.516 and hence the results show that the developed method was accurate. The robustness of an analytical method was determined by analysis of aliquots from homogenous lots by different physical parameters such as a change in flow rate to 1.0 ± 0.2 mL and changing detection wavelength 242 nm ± 1 nm and mobile phase composition change to 50:50 v/v ± 5v/v. The obtained values indicate that the method was quite robust. In this proposed method the LOD was 0.003 µg/mL, and the LOQ was 0.0099 µg/mL obtained. So this method was very sensitive as they were within the permitted limits. Ultimately the method was examined for quantification of marketed formulations. The % assay values for Cilacar tablets was 99.80 ± 0.002, and the results so obtained therefrom as shown in Table 4. The chromatogram of the marketed formulation is shown in Fig. 12. So, that this method can be successfully applied for the estimation of Cilnidipine. * Each value is mean ± deviation of six determinations. CONCLUSION: The UV spectrophotometric method and the HPLC method for the estimation of Cilnidipine in pharmaceutical formulations were found to be simple, precise, sensitive and accurate. The method was completely validated and showed satisfactory results. The method was free from interference of the other active ingredients and additives used in the formulation. From the above UV experimental data results and parameters, the developed method has advantages like the less time taken for preparation of standard and sample solutions and hence suitable for the analysis of Cilnidipine raw material and its pharmaceutical dosage form. The RP-HPLC method for the estimation of Cilnidipine has various advantages like low solvent consumption, less retention time, excellent peak symmetry, highly sensitive, precise, accurate and robust. Results of the study indicate that the developed methods were found to be accurate, precise, linear, sensitive, simple, economical, reproducible have short run time which makes the method rapid. Hence it can be concluded that this method may be employed for the routine quality control analysis of Cilnidipine in active pharmaceutical preparations. ACKNOWLEDGEMENT: The authors would like to thank Hetero laboratories, Hyderabad for providing the samples of Cilnidipine. We are highly grateful to Dr. L. Rathaiah, honorable chairman, Vignan group of institutions, and Dr. P. Srinivasa Babu Principal, Vignan Pharmacy College, Vadlamudi, Guntur - 522213 for providing necessary facilities to carry out this research work. Kokilambigai KS, Lakshmi KS, Kumar A, Chandrayan G, Kumar S and Singh MK: Spectrophotometric estimation of Cilnidipine in bulk and pharmaceutical dosage form using N-(1-naphthyl) ethylenediamine dihydrochloride. Int J Pharm Sci 2014; 6: 576-578. Buchiya FV, Bhim AI, Raj HA and Jain VC: Simultaneous determination of Cilnidipine and Valsartan in the synthetic mixture using the spectrophotometric technique (simultaneous equation method). Asian J Pharm Ana 2015; 5: 21-25. Patel SN, Hinge MA and Bhanushali VM: Development and validation of a UV spectrophotometric method for simultaneous determination of Cilnidipine and Chlorthalidone. Journal of Pharmacy Research 2015; 9: 41-45. Hinge MA, Desai DD, Patel ES, Singh R, Chavda R and Patel D: Development and validation of UV spectrophotometric method for simultaneous estimation of Cilnidipine and Metoprolol succinate in bulk drugs and combined dosage forms. Der Pharmacia Lettre 2015; 7: 299-306. Patel PR, Patel N and Shah SK: Analytical method development and validation for simultaneous estimation of Nebivolol hydrochloride and Cilnidipine in the combined dosage form. Journal of Chemical and Pharmaceutical Research 2015; 7: 951-960. Ahmed M, Rashmi DR, Shetty AS, Anilkumar SM, Ravi MC and Kuppast IJ: RP- HPLC method development and validation for simultaneous estimation of Cilnidipine and Olmesartan medoxomil in the combined tablet dosage form. World Journal of Pharmacy and Pharmaceutical Sciences 2015; 4: 785-795. Sunitha N, Marihal SC, Sravanthi JS, Venu A, Rao BVN and Rao BA: Method development and validation of RP-HPLC method for the simultaneous estimation of Olmesartan and Cilnidipine in bulk and formulations. 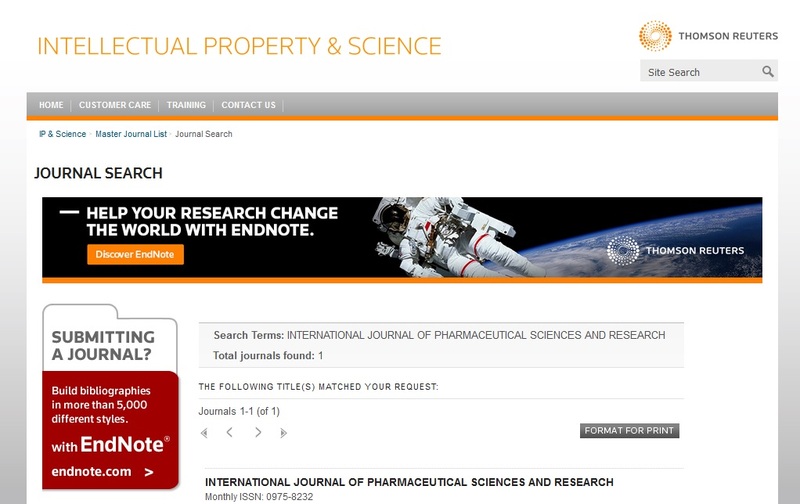 International Journal of Pharmaceutical Research and Allied Sciences 2015; 4: 127-135. Rupareliya RH and Joshi HS: Stability indicating simultaneous validation of Telmisartan and Cilnidipine with forced degradation behavior study by RP-HPLC in the tablet dosage form. Hindawi Publishing Corporation ISRN Chromatography. 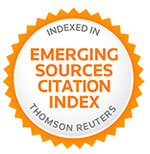 2013; 1-6. http://dx.doi.org/10.1155/ 2013/461461. Desai D, Vashi N, Dalvadi H, Desai S and Hinge M: HPTLC method development and validation of Cilnidipine and Metoprolol Succinate in the combined dosage form. Pharm Methods 2016; 7: 28-34. Zhang X, Zhai S, Zhao R and Baeyens WRG: Determination of Cilnidipine, a new calcium antagonist, in human plasma using High-Performance Liquid Chromatography with Tandem Mass Spectrometric Detection. Analytica Chimica Acta 2006; 600: 142-146. Lee KR, Chae YJ, Lee JH, Lae JH, Kim DD, Chong S and Shim CK: Quantification of Cilnidipine in human plasma by Liquid Chromatography-Mass Journal of Liquid Chromatography & Related Technologies 2012; 32: 308-320. Ravishankar P, Swathi V and Srinivasa Babu P: Current trends in the performance of forced degradation studies and stability indicating studies of drugs. IOSR-JPBS 2017; 12: 17-36. Panchumarthy R, Navya NC, Pravallika D and Navya Sri D: A review on step-by-step analytical method validation. IOSR Journal of Pharmacy 2015; 5: 07-19. Ravishankar P, Gowthami S and Devala Rao G: A review on analytical method development. Indian Journal of Research in Pharmacy and Biotechnology 2014; 2: 1183-1195. ICH Q2 (R1): Validation of analytical procedures, Text and International Conference on Harmonization, Geneva 2005: 1-17. Sankar PR, Swathi V and Babu PS: Development and validation of novel UV and RP-HPLC methods for determination of Cilnidipine (a new generation Ca channel blocker) in pharmaceutical dosage form. Int J Pharm Sci & Res 2019; 10(4): 1886-94. doi: 10.13040/IJPSR.0975-8232.10(4).1886-94.